Chef Kel Zaguirre has fun with the dish du jour. 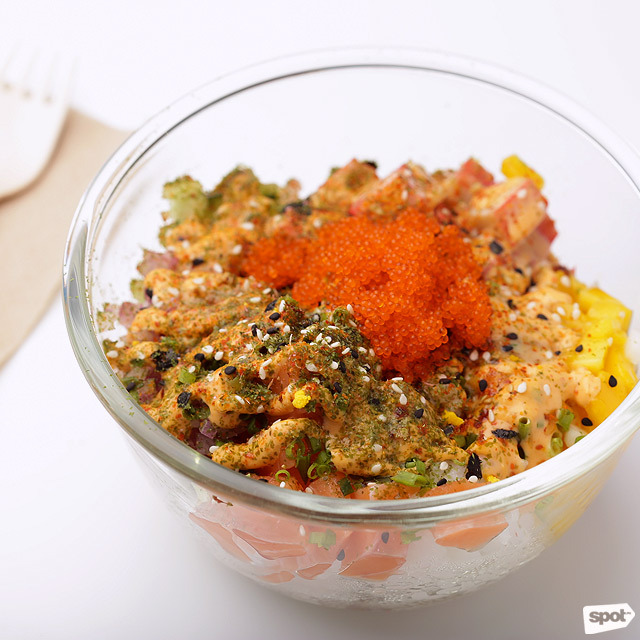 (SPOT.ph) Seafood and rice are two things that are in abundance here in the Philippines, so it’s no surprise that the local food scene quickly warmed up to the poke bowl. The Hawaiian dish, traditionally made in a bowl with rice, sliced raw ahi tuna, seaweed, plus rice vinegar and soy sauce for seasoning, is actually pretty versatile, so it makes the perfect canvas for chef Kel Zaguirre and his overflowing creativity. Chef Kel Zaguirre helps us come up with our own poke bowl. Anyone who’s familiar with Locavore, FAT, and Empingao! 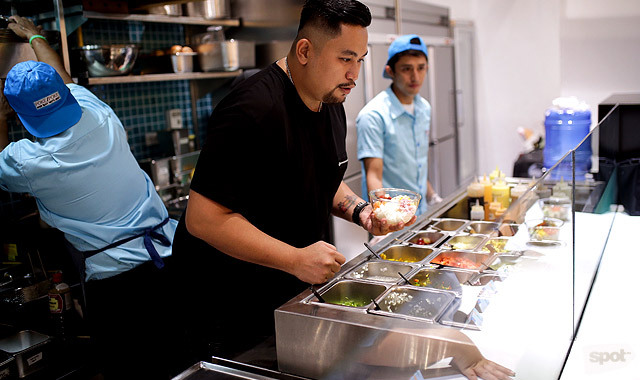 knows that with Chef Kel, it’s all about putting his own bold spin on traditional concepts, and it’s no different here at Poke Poke, his newest venture with co-owners Speedy and Alta Lyttle (the same couple behind Locavore). 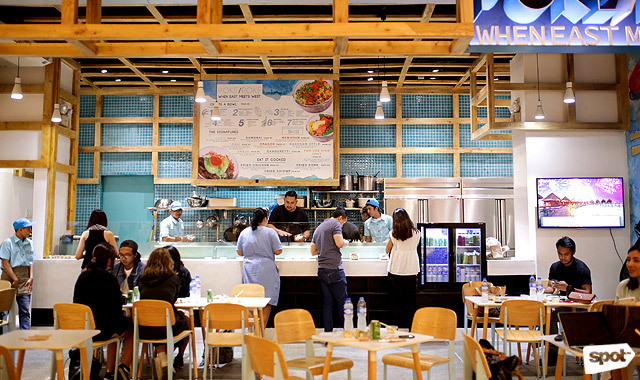 As Chef Kel talks about the thought process behind Poke Poke’s menu, the word "different" crops up more than a few times. A quick glance at the Signatures confirms this, with combinations that promise flavors from Japan and Korea to Hawaii, California, and even Italy. 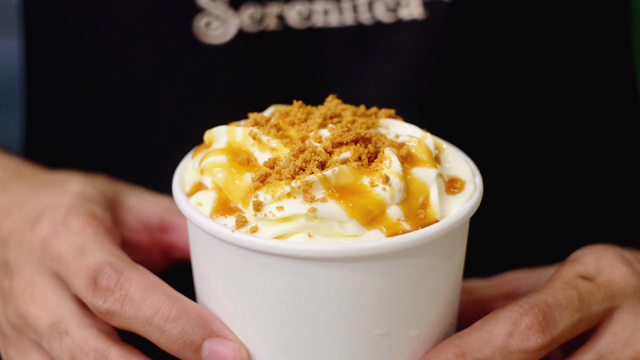 There’s no room for purists here, but adventurous foodies and anyone who’s willing to try new things are in for a treat. 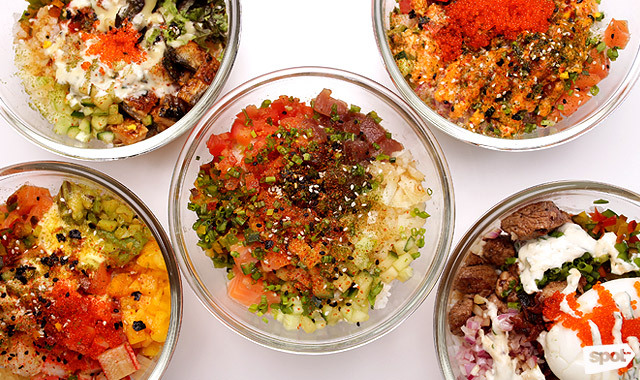 With decidedly untraditional elements like steak, Sriracha, and mayonnaise making an appearance in Poke Poke’s bowls, it’s easy to judge the menu as slapdash, but everything is actually well-thought-out. Beyond the usual shoyu or Japanese soy sauce, and vinegar, Chef Kel crafted a line of sauces that will pair perfectly with any kind of protein, vegetables, fruit, and grains. 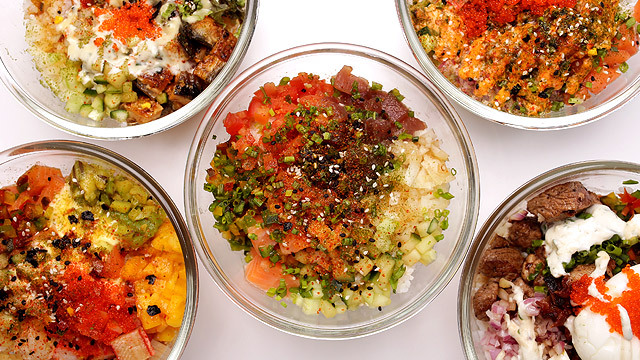 And despite bold flavor combinations, every bowl has the restrained delicate balance that every good poke bowl should possess. 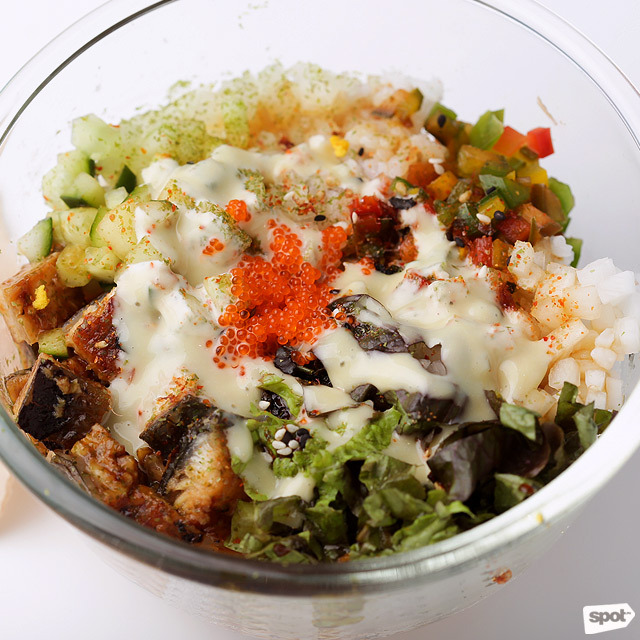 This balance is best tasted in the Basic (P280), a good bowl to order if you simply want to have all the good stuff. The freshness of the ahi tuna and salmon is evident in every bite, with just the right amount of dressing to tie all the elements together. The contrast of the slippery unagi or freshwater Japanese eel with the crunch of the vegetables makes the Unaju (P450) a delight for the senses, with the spice from the yakitori sauce balanced out by the shoyu. 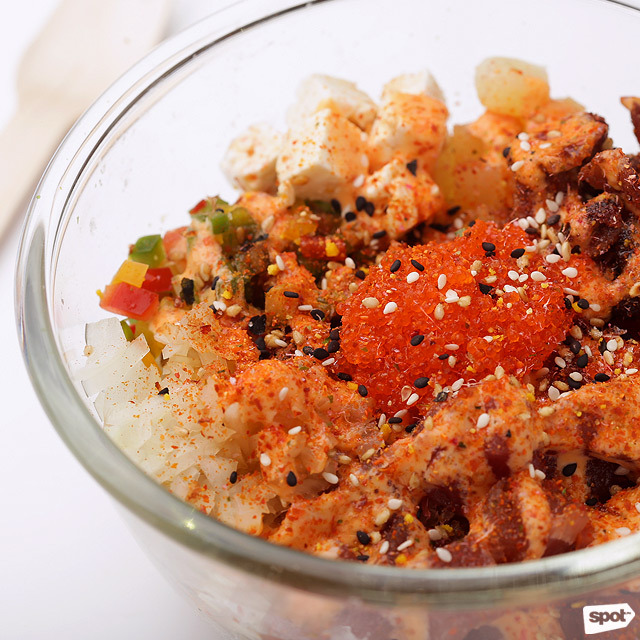 A splash of shoyu and the addition of sweet mangoes also tempers the heat of the Sriracha in the Korean-inspired Gangnam Style (P320), with rice, sashimi, kani, and fried chicken skin. A combination that tastes familiar yet also novel is the Cali (P300). Think California Maki, but deconstructed into a bowl with kani, raw fish, and a special mangonnaise (or mango mayonnaise) on top of a bowl of Japanese rice. 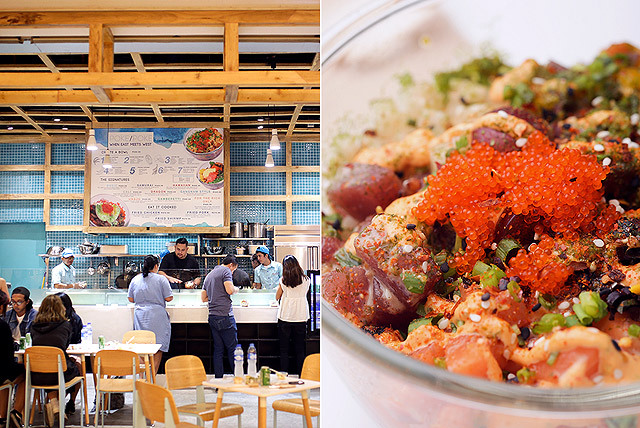 But if you’re dining here at Poke Poke, go all out and treat yourself to For The Rich Only (P480). 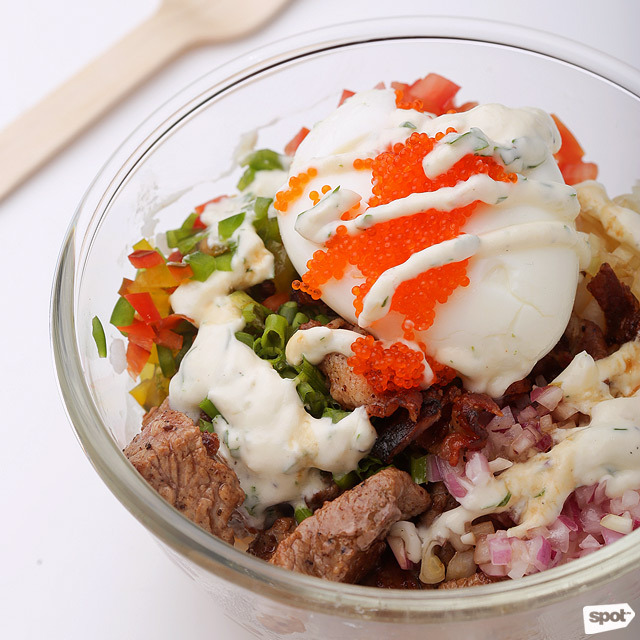 Choice steak cubes are cooked until perfectly juicy then placed on top of warm rice with a soft-boiled egg, crispy bacon, and fish roe. A dash of white truffle oil finishes the dish and lends it just the right amount of indulgent flavor without making it too overwhelming. While this bowl may seem the least like a poke bowl among the bunch, the restraint and attention to the balance between each element of the bowl is still apparent. 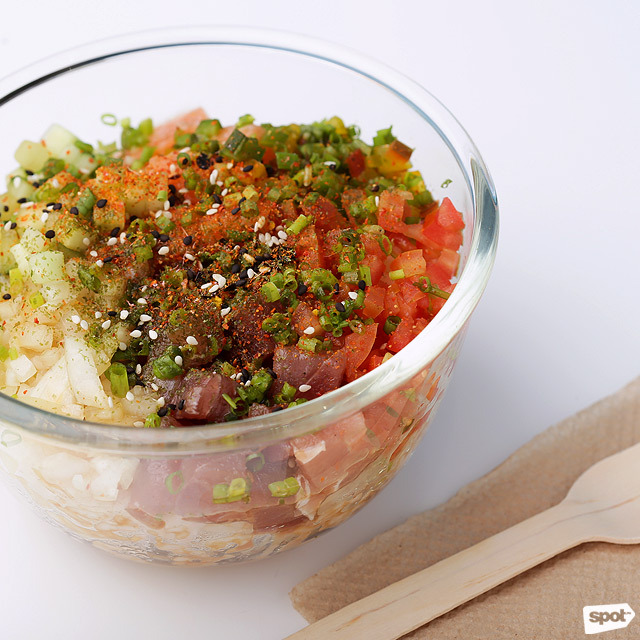 Because of the versatility of poke bowls, Poke Poke also lets customers make their own combinations. Admittedly, the choices may seem paralyzing, with a whole range of proteins, toppings, and dressings to choose from. But, Chef Kel assures us that there is no “wrong” mix—the menu is designed so that everything goes well with everything else. 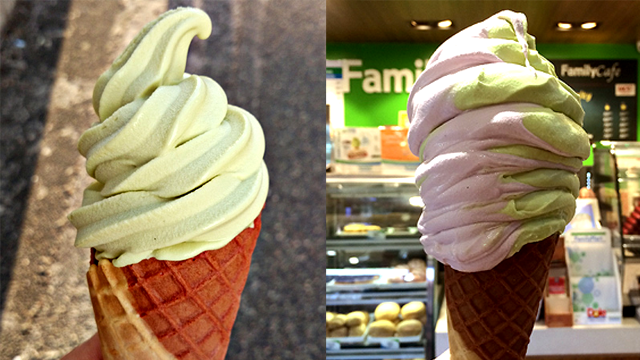 So go ahead and try the most outrageous combo you can think of—it’s sure to be delicious.